30th January 2018 – I just dropped some wood on Tordino. I can now continue to work in the hold this weekend. It will be raining the next couple of days and then I don’t want to open my hatches. 28th January 2018 – Just another day shooting nails into t&g. This time I worked some more around the old cabin. 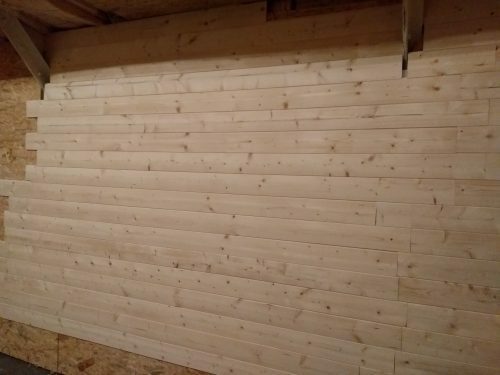 27th January 2018 – The roof of the old cabin will be done in pine wood, painted creme white. 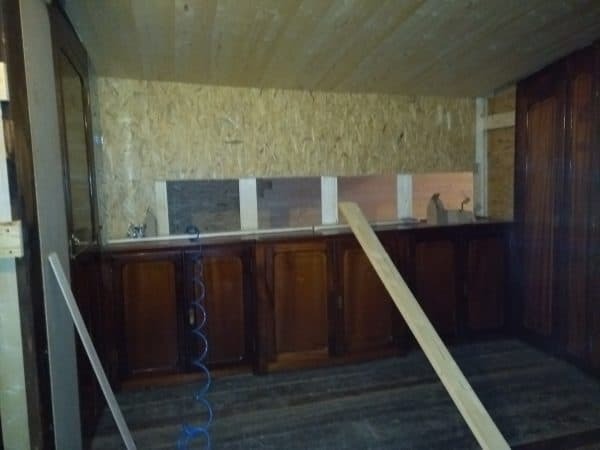 The same will be used fot he back wall of the sleeping room and kitchen. I had 20 packages of t&g left, they all went up in that one ceiling. 25th January 2018 – To make sure everything is in accordance with the regulations, I just ordered some new equipment for both ships, including life rings and other safety tools. The old ones will make it into my museum. 24th January 2018 – I went to a lecture about the CVO/CBB certification in Zuthpen. The most important item was to request a survey before 1st November 2018! I requested mine in the beginning of this year. 23rd January 2018 – Last weekend, it started raining while unloading the van. I put the wood on the platform and covered it with the hatches. 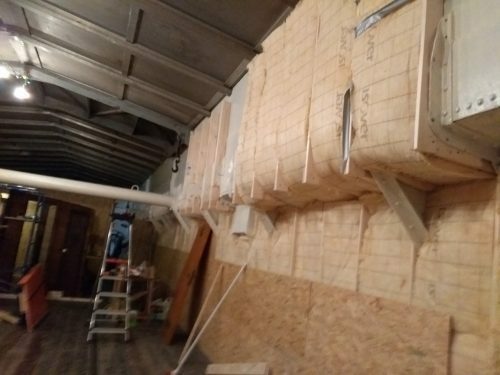 This evening, I lowered it in the hold, so I can continue with finishing the walls. 21st January 2018 – Every muscle in my body was hurting. Working was no option today. I drove around in Holland to pick up several museum objects like namesigns, paintings and books. First time doing long distances with my new van! Was a great journey. 20th January 2018 – In the early morning, I mounted OSB on top of the frame from the old accommodation. 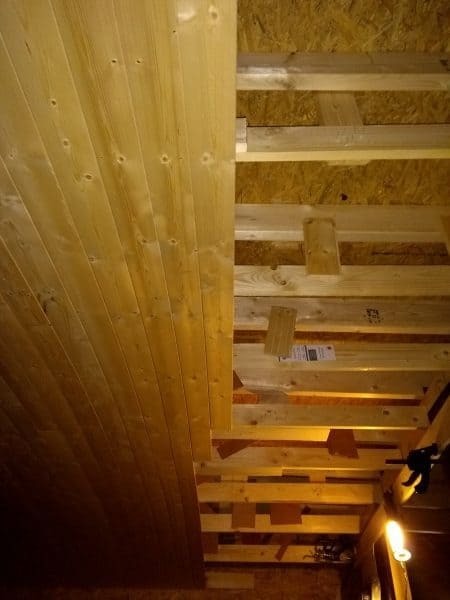 I can now walk on it to finish the walls above and to build the ceiling of the hold. 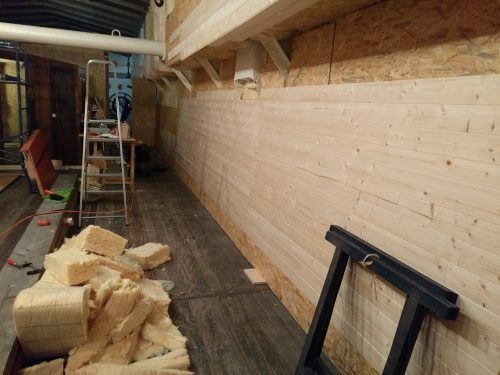 19th January 2018 – Wood had to be delivered today. The company couldn’t tell me exactly when they would come, so I started working in the hold. It was a lovely dry day. Hatches were open and it felt like working outside on a sunny day. fresh air, not to cold! The door in the corridor to the second part of the hold was mounted. It is the same style of door as the main entrance. 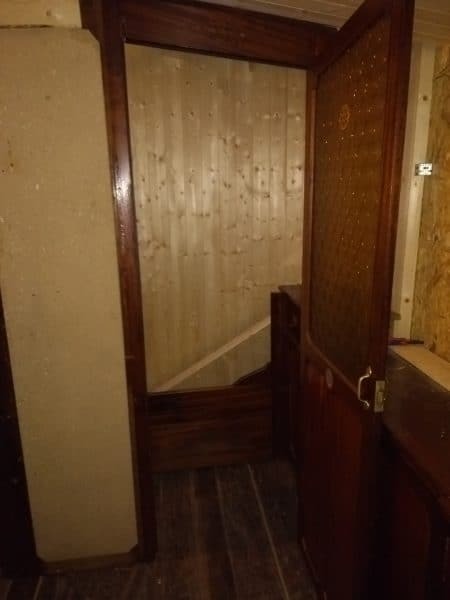 Last year I bought three similar old cabin doors. They have nice brass fittings. Wood was delivered in the afternoon. I cut the wooden beams on the right size and mounted them above the old accommodation. I took beams of 14cm heigh to make sure it could support itself. 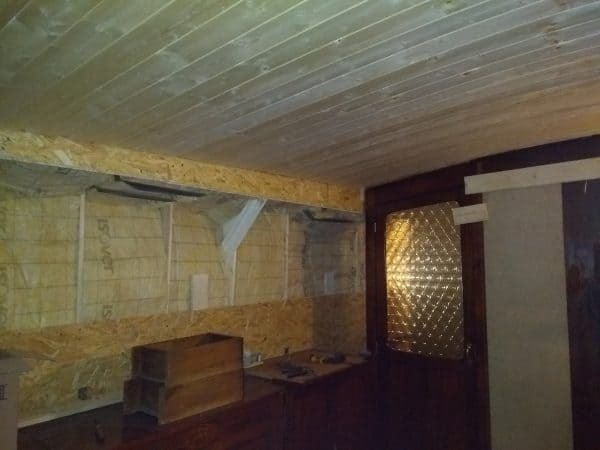 I now have a frame for the ceiling of the old cabin! 16th January 2018 – I’ve just spent an evening working on Tordino. 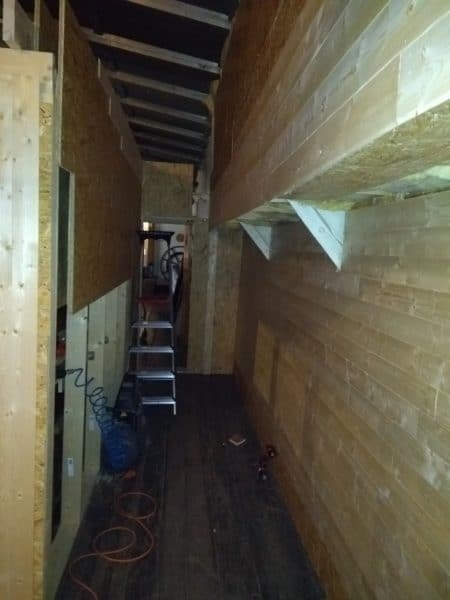 The walls are now finished on the outside of the old cabin. It now looks like a square box. 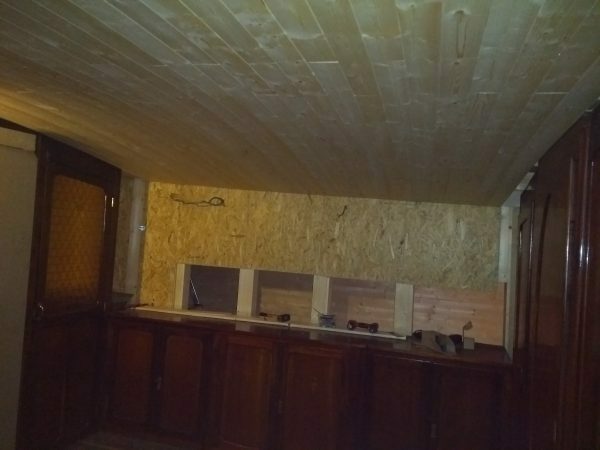 I was surprised to see how much plywood went into making these walls. 15th January 2018 – I just moved the story on the Escapade from the old to the new site! The conversion of the Aquarel is a bit longer. I’ve just moved the year 2016 and 2017 to this new site! 14th January 2018 – Eighteen square meters done with t&g. I’ll have to do at least that amount again somewhere next week. It is a job without thinking. Just unpack it and shoot a few nails through each wooden plank against the wall. So repetitive…. The more I’m finishing the hold, the better the room starts looking. I can’t wait to hang the paintings, furniture and objects. 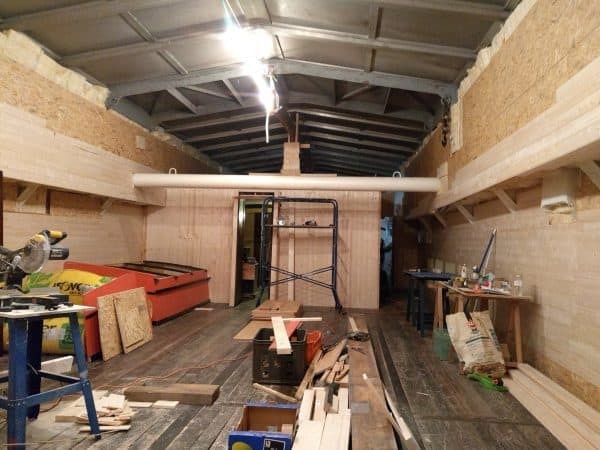 13th January 2018 – I started unloading the van, then drilling holes for the remaining day. I ran out of bolts, so I couldn’t continue with the frame. Annoying, but there was plenty of other work to do. I don’t think I will make my deadline, the end of March.